The National Bureau of Economic Research has officially confirmed what everyone already knew: The U.S. economy has been in recession for many months. The question now is whether anything constructive can be done about it. Historically there have been two very different public policy responses to a serious economic slowdown. The first—laissez-faire—is simply to allow market prices to adjust to the new economic reality. Since most economic slumps are caused by a decline in demand associated with the bursting of a credit/money bubble, prices tend to adjust downward fairly rapidly. We have seen some of this in the current crisis with real estate, stock and commodity prices (especially crude oil) falling dramatically. This falling price process tends to “clear out” the malinvestments of the credit boom and eventually sets the stage for a sustainable economic recovery. This price adjustment process, though efficient, is painful. And the larger the initial credit bubble the larger and more painful the collapse. Many thousands of homes go into foreclosure, banks and hedge funds fail, capital goods industries are especially hard hit, and the recession normally lasts between 11 and 14 months. Lower interest rates and modest unemployment benefits tend to ease the economic hardships somewhat. We have had 10 recessions since 1948 and managed to survive them all. An alternative policy approach, which is being tried this time, is to treat the recession with almost unprecedented doses of government intervention. In this scenario, the Treasury and the Federal Reserve engage in policies aimed at “reflating” the bursting credit bubble. The Fed lowers interest rates dramatically and inflates the money supply by purchasing government and even commercial debt. And the Treasury gets the legal authority to spend upwards of $700 billion to bail out Fannie and Freddie, commercial banks, investment banks, insurance companies, and any other private firms too big to fail. So far, at least, the results of this approach are not promising. The final public policy shoe to fall early next year will probably be massive public works programs (infrastructure spending) to create “jobs.” The President-elect Obama economic team and economist Paul Krugman have already gone on record as favoring such a proposal. They also seem to support another, bigger, round of so-called “stimulus” spending by consumers funded by tax rebates. But will any of this shorten the recession? A decent argument can be made that all of these public policy responses will only make things worse and prolong the slump. The longest recession in modern times is the one that began in 1929. It lasted a full 43 months and was quickly followed by the 1937 recession that lasted another 13 months. Almost one half of the months between 1929 and 1939 were recessionary. And between 1929 and 1939, the average yearly unemployment rate in the U.S. was a staggering 16.9%. Though Presidents Hoover and FDR unbalanced the federal budget, created the Reconstruction Finance Corporation (to bail out banks and businesses), enacted the National Industrial Recovery Act, engaged in massive public works projects (WPA), and inflated the money supply sharply after 1934, nothing really worked. After 10 years of political and economic unrest and uncertainty, the unemployment rate was still 17.2% on the eve of our entry into WW2. Laissez-faire economic ideas (deregulation, tax cuts) are currently out of favor but the fact remains that the Krugman and Keynesian policies of bailouts, deficit financing, and public works have never really worked. They didn’t work in the U.S. in the 1930’s; they didn’t work in the 1990’s in Japan. They don’t work because they prop up unsustainable investments in the private sector rather than clear the way for new entrepreneurship. And they don’t work because government central planning is hopelessly naïve (they even have trouble mailing out rebate checks). Sometimes in economics (as in medicine) doing “nothing” (allowing the system to heal itself) works better than drugs with nasty side effects or bureaucratic attempts at reconstructive surgery. Dominick T. Armentano is professor emeritus in economics at the University of Hartford (Connecticut) and a research fellow at The Independent Institute in Oakland, Calif. He is author of Antitrust & Monopoly (Independent Institute, 1998). What it does not address, however, is how our republic has morphed into a government that is now controlled by money and the few who control it – Oligarchy. Obama's Economic Plan... Money for Nothing – Get Your Chicks for Free! President-elect says he wants to double renewable energy production, rebuild roads and schools and cut taxes. Next step: Consulting with Congress. NEW YORK (CNNMoney.com) -- President-elect Barack Obama on Saturday offered the most detailed statement yet of his economic recovery plan, sketching out broad-based spending proposals and tax incentives aimed at reviving an economy mired in recession. • and provide tax breaks to American workers. "Economists from across the political spectrum agree that if we don't act swiftly and boldly, we could see a much deeper economic downturn," Obama said. "That's why we need an American Recovery and Reinvestment Plan that not only creates jobs in the short-term but spurs economic growth and competitiveness in the long-term." The main goal of his plan: to create 3 million new jobs. Most would come from the private sector, he said. As Obama prepares to take office on Jan. 20, the country faces a series of severe economic and political challenges. Nearly 2 million jobs were lost in the first 11 months of 2008 - the final government reading on the employment picture will be released on Friday - and the economy has stagnated. Investors suffered the worst year in stocks since the Great Depression, and foreclosures are rising while housing values are declining at record paces. Virtually every state is facing a budget shortfall, forcing many to make plans to cut back on critical services and raise taxes. To that end, Obama's advisers and lawmakers have said they expect his legislation to provide increased aid to states to pay for Medicaid, as well as a boost to unemployment benefits and food stamps. However, he didn't mention it in his address on Saturday. Obama's video address did not attach an estimated price tag to his proposal, but his advisers have said publicly they expect the size of the spending package to range between $675 billion and $775 billion. The first is in the area of basic math. If our problem is that we are too much in debt and don’t have enough money, how does spending more while cutting taxes help that situation, exactly? Ha, ha – that’s right, we’re going to “stimulate” our way out debt! Ho, ho, hardy, har, har – that’s a good one. Look, substitute the word “tax” with the word “income” and you can see that spending more while at the same time cutting your income – while at the same time being up to your eyeballs in debt just isn’t going work out well, math wise. The math underlying our entire economy simply doesn’t work any longer as I spelled out here When the Math No Longer Works..., and here Death by Numbers. The second failure in being honest is this; if a “civilian” company is started solely to help accomplish the above items for the government using taxpayer dollars, are those jobs that are “created” really private sector jobs? So everyone knows where this “money” will come from, right? The now proverbial printing presses – that’s correct! Is it possible to print our way to prosperity? How’s that worked out in the past? Uh, huh… that’s what I thought. Money for Nothin’ – get your chicks for free? These latest targets are all pretty much consistent with one another. The targets are a little higher than I would think, especially with the financials and REITS not leading – but both do, however, have bullish targets showing as well. 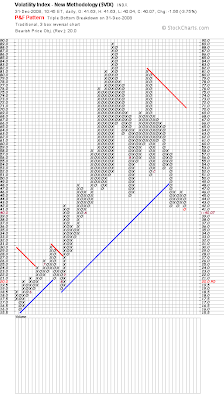 These P&F charts have the DOW targeting 10,400 and the S&P targeting the 1,070 area. That area is consistent with a 61.8% retrace of the last down wave, but I’ll be surprised if they make it over the 50% retrace level which would put the S&P just a little over 1,000. 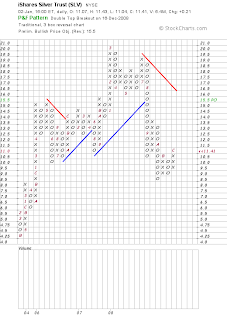 We’ll see, these P&F diagrams are pretty good at identifying support and resistance levels as well as breakouts and breakdowns. 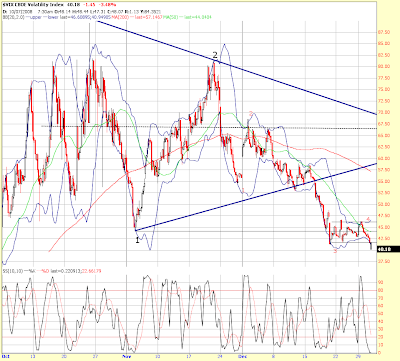 The CRB was up big today, but has not produced a breakout, although oil and natural gas have. REITS have produced higher targets and SRS now has a price objective of only $36! That’s quite a rout from the nearly $300 level it was at just a little over a month ago. That’s exactly why the leveraged ETFs are not buy and hold. Please keep in mind that this is likely wave ‘B’ up/sideways that we’re experiencing. It should last for a little while into the new year, but I do not expect it to last much longer than that – please view my Predictions for 2009 if you haven’t already. States Seeking $1 Trillion from Fed! One of my 2009 predictions is already shaping up nicely…. See my bullet points near bottom: Predictions for 2009... Riders on the Storm! PHILADELPHIA (Reuters) - Governors of five U.S. states urged the federal government to provide $1 trillion in aid to the country's 50 states to help pay for education, welfare and infrastructure as states struggle with steep budget deficits amid a deepening recession. The governors of New York, New Jersey, Massachusetts, Ohio and Wisconsin -- all Democrats -- said the initiative for the two-year aid package was backed by other governors and follows a meeting in December where governors called on President-elect Barack Obama to help them maintain services in the face of slumping revenues. Gov. David Paterson of New York said 43 states now have budget deficits totaling some $100 billion as tax revenues plunge. "It's clear that the federal government needs to step in and jump-start the economy," said Gov. Deval Patrick of Massachusetts. The latest package calls for $350 billion to create jobs by building or repairing roads, bridges and other public works; $250 billion to maintain education; and another $250 billion in "counter-cyclical" spending such as extending unemployment benefits and food stamps, which are typically a responsibility of the states. The remainder would be used to fund middle-class tax cuts, stimulate the embattled housing market, and stem the tide of home foreclosures through a loan-modification program. Gov. Jon Corzine of New Jersey said he hoped some of the $700 billion authorized by Congress in the Troubled Asset Relief Program would be available to help the housing market. The governors said during a conference call with reporters that the plan had been discussed with Congressional leaders and the incoming administration, which had indicated its willingness to help. "The Obama team has been very receptive in listening to us," said Gov. Jim Doyle of Wisconsin. He said "quite a number" of other governors back the initiative. The Republican Governors Association, however, said the level of federal aid being sought would create a burden for the future. "The proposal by the Democratic governors goes beyond things like 'shovel-ready' infrastructure projects and is essentially a bailout of these states' general funds," Nick Ayers, executive director of the Republican Governors Association, said in a statement. "Now is the time to focus on finding cost-effective ways to provide essential services without burdening future generations with ever greater debt." Doyle of Wisconsin said the plan would allow states to maintain essential services at about the current level until 2010, when the national economy is expected to begin a recovery. The proposal comes amid expectations that the Obama administration, which takes office on January 20, will provide hundreds of billions of dollars in economic stimulus to boost the shrinking U.S. economy and halt the loss of jobs. Paterson of New York said his state's budget deficit has surged to $15.4 billion currently from $5 billion in April 2008, despite a 3.2 percent cut in the education budget. Note that while the smaller aggregate is spiking, the larger M3's growth rate was falling, but my understanding is that it has just recently turned up again. None of the aggregates track the effects of the Shadow banking system and that must be kept in mind. For the day the DOW closed up 258 points (2.9% - btw, at 9,034, see prior update), the S&P finished up 3.2%, the NDX led the way, up 4.3%, the RUT was the laggard up only 1.3%. Notable, the XLF only finished up 1.1%, and USO finished up a whopping 7.64%. If you would like to know a site I use a lot for fast updates, this market summary page will give the fastest glimpse at what market segments are leading and which are trailing… check out the Disk Drives, Semis, and Oil Services: StockCharts.com – Market Summary. Okay, let’s take a look at a 5 minute SPX chart. Basically a straight line up for the past 4 trading sessions. This looks like 5 waves up to me, all of equal length. There’s a pivot point at 935 that stopped the advance, and since all the short term oscillators are WAY overbought, I took a stab with a small short play at the 935 level (961 is the next higher pivot). This will be a very short term trade. If we break above 935, I’ll exit and look for re-entry later, but I’m thinking we should see some sort of pullback on Monday. My thinking goes like this: we are in the large wave ‘B’ up/sidways and this is wave ‘c’ up within wave ‘B’. Within wave ‘c’ up, we should have another smaller a-b-c. This 5 wave move may have completed, or nearly completed wave ‘a’, and we should get a wave ‘b’ followed by a final wave ‘c’ up of wave ‘c’ up. Make sense? That final wave ‘c’ should carry us to about the 1,000ish range on the S&P. I could be early, this wave ‘a’ of ‘c’ may not be complete, but it looks like it to me. 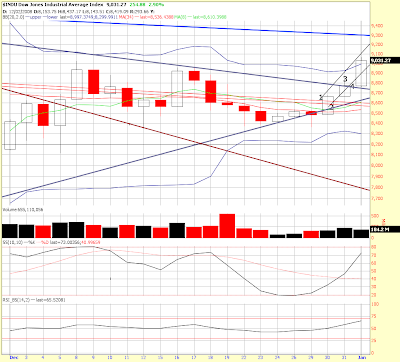 Also, all of the short term stochastics are very overbought. Next let’s look at the SPX 1 month daily. 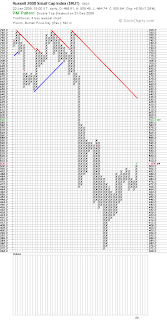 Here you can see a great big 35 point range candlestick that closed above the upper Bollinger. Finding plays outside the limits of the Bollinger bands are frequently some of my best. Typically you will get a pullback at least down to within the confines of the bands before climbing significantly. Doesn’t mean that it can’t happen, but there’s obviously more room down than up, despite the positive momentum and what the media pronounces. 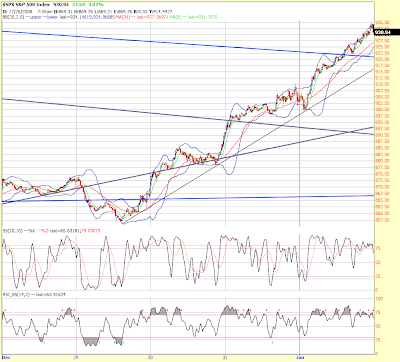 Also note that the daily fast stochastic is nearly overbought as is the RSI. Here’s the DOW daily. 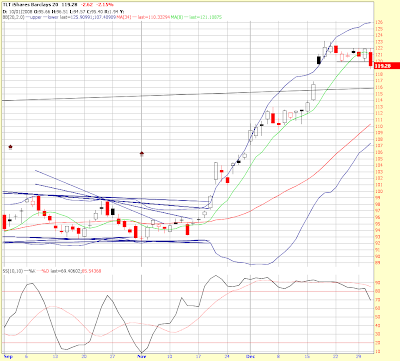 Again, note the close above the upper Bollinger, and rapidly climbing stochastic and RSI. The volume here shows that today’s was slightly less, but the DIA and SPY both show that the volume was higher. That’s confirmation of higher prices and is, in fact, the first rally in a very long time where the volume has been rising with prices, although it is still light. While I’m thinking of it, advancing issues were about 5 to 1 on the NYSE today, again very positive. 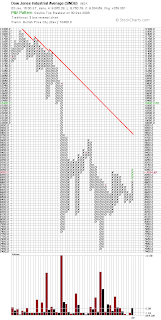 Finally, this last chart is a busy view of the past 3 months of sideways action on the DOW. You can see that we have exceeded the range of the past month, but there is still resistance above. The market pumpers are really out in force today. I can’t tell you how many times I’ve heard that the market rallying on bad news is good news and shows how “healthy” the market is. “The market leads the economic upturn… It’s a forecasting mechanism… The stock market’s on sale… The bottom is in…” Blah, blah, blah… almost always words spoken by those who are trying to take your money – what a bunch of bull. Just a reminder to ask yourself what they were saying at the beginning of last year (the same thing!). Jan. 2 (Bloomberg) -- Global semiconductor sales fell 9.8 percent in November, the second straight monthly slide, as a deteriorating economy hurt chip demand, an industry group said. Total sales fell to $20.8 billion from $23.1 billion a year earlier, the Semiconductor Industry Association said in a Business Wire statement today. In the first 11 months of 2008, sales rose 0.2 percent to $232.7 billion from a year earlier. In October global chip sales declined 2.4 percent. “The worldwide economic crisis is having an impact on demand for semiconductors, but to a lesser degree than some other major industry sectors,” George Scalise, president of the San Jose- based association, said in the release. Researcher iSuppli Corp. forecast Dec. 16 that global stockpiles of semiconductors will almost triple in the last quarter of 2008 and issued a “red alert” on chip inventory levels for the first time. Gartner Inc. projected worldwide chip sales will fall 16 percent in 2009 and the Semiconductor Industry Association forecast global chip sales will drop 5.6 percent this year, the first decline since 2001. 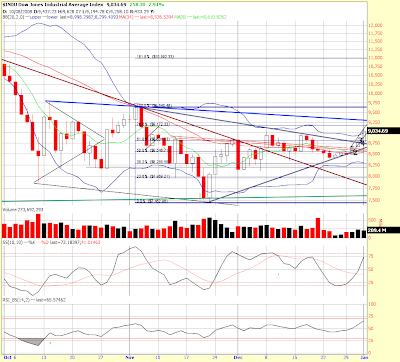 You can see that the rally has continued defying the short term oscillators. The DOW is currently up nearly 200 points. Here’s the way the math works on this current leg up, you can follow along on this 5 day 5 minute chart of the DOW… wave 1 ran about 270 points up, then retreated in wave 2. Wave 3 ran from about 8,560 to 8,830, again almost exactly 270 points, then wave 4 was more of a sideways movement that ended at 8,761. If wave 5 is the equal of 1 and 3, it should terminate in the 9,030 area. 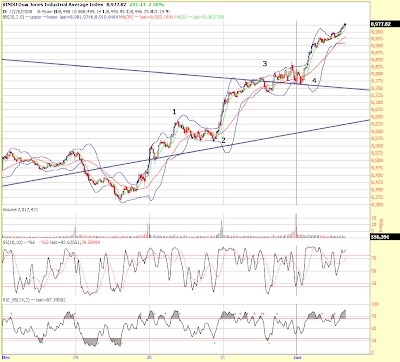 Wave 5, however, can terminate early or it can extend (which would surprise me here). 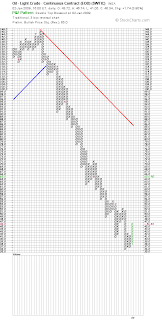 Below is the 20 day, 20 minute chart of the SPX. 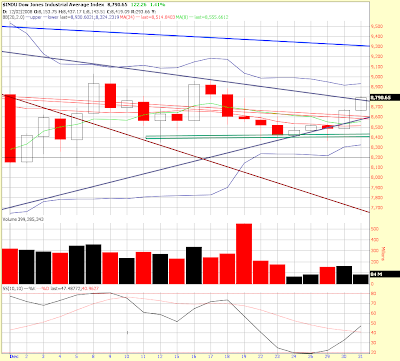 Note deeply overbought indicators and that is has overthrown the dark blue downtrend line. We clearly broke above the recent tops at the 918 level. Bonds are continuing to decline as is the VIX which is still down about 6% on the day. 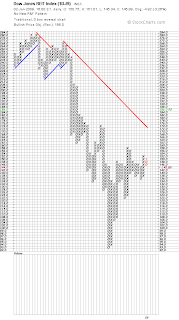 The XLF is not advancing commensurate with the rally, nor is the RUT, however the NDX is leading. Gold is down, but USO is up nearly 6%. Peter Schiff Running for the Senate? Go, Peter, Go! Peter Schiff running for the U.S. Senate? I’d support that whole heartedly! Manufacturing ISM - Don't Get Fooled Again! So, when the market goes up on bad news, that’s good, right? Tell ya what, those who do not see what’s happening clearly will be fooled – AGAIN – into believing that the economy has bottomed and that equities are going higher. Is that what we believe, that bad news is good news? Do we believe that wealth can come from a printing press and not from the manufacturing of tangible goods? Jan. 2 (Bloomberg) -- The decline in U.S. manufacturing deepened in December as demand for such products as cars, appliances and furniture reached the lowest level since at least 1948, signaling further cutbacks in factory jobs and production this year. The Institute for Supply Management’s factory index fell to 32.4, below economists’ forecasts and the lowest level since 1980, from 36.2 the prior month. Readings less than 50 signal contraction. The group’s new-orders measure reached the lowest level on record and prices slid the most since 1949. “Every component suggests that the weakness is going to carry over into 2009,” Mark Vitner, a senior economist at Wachovia Corp. in Charlotte, North Carolina, said in a Bloomberg Television interview. “There’s just not a whole lot of new business coming in,” and companies will have a “painful adjustment” as consumers shun spending. Today’s figures underscore that, with private demand collapsing, manufacturers’ best hope for new business this year may be President-elect Barack Obama’s plans for an unprecedented stimulus package. Obama has pledged an investment program in roads, schools and the U.S. energy network akin to the 1950s- era interstate highway construction boom. Stocks advanced on the first day of trading in 2009, following the biggest annual drop for the Standard & Poor’s 500 Index in 71 years, on expectations government stimulus efforts will curtail the recession. The S&P index rose 1.4 percent to 916.16 at 11:08 a.m. in New York. Benchmark 10-year Treasury yields rose to 2.25 percent from 2.22 percent late Dec. 31. If you happen to be one of those who believe that bad news is actually good news, guess what? The Who were kind enough to do a performance just for you! The stochastic remains overbought which for me is problematic if we do manage to break above 918.50 which is the height of the last two peaks. It’s also a significant resistance area going further back in time. 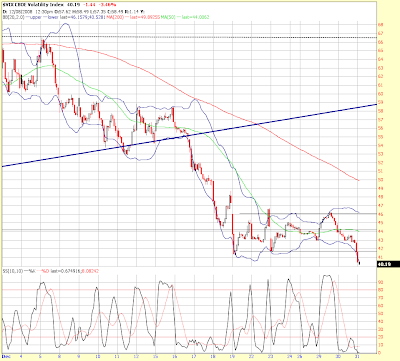 And, it’s also now coincidental with that blue downtrend line and the upper Bollinger band. Thus, if we break above 920, I am personally NOT going to chase it even though I think higher prices are in the cards for a while here. I think the likelihood of a throw-over then pullback is very high, but I’m also cognizant of the fact that rallies can continue in short term overbought conditions. Still, it’s one of my rules to NOT enter trades in the current direction when the oscillators are at their extremes. If anything a short term short play from 920 might be a good play, but since this is most likely wave ‘c’ up, playing short here doesn’t sound that great to me either. Thus, I’m going to practice patience and wait for an entry I like. The VIX is down to the 37 level, about a 5.3% move, and the long bond market looks like it wants to fill that gap, TLT is in the 118 to 119 range – not a large move today, but not reversing Wednesday’s large move either. Futures for the first trading day of 2009 are about even. That’s actually up quite a bit from where the market left the lockup at the end of the last session. After mulling over the charts for the past couple days, it does appear to me that we’re getting ready for another move higher in the near future that would be wave ‘c’ up of wave ‘B’, with the same targets discussed many times now – about 1,000+ on the S&P. In the very short term, the 60 and 20 minute stochastic are overbought and the percent of stocks over their 5 day average is above 90%, so I would expect some pullback in here. Of course I said the same thing for the last session and it managed to hang on until the very end. Those oscillators can remain overbought just as they can remain oversold. NEW YORK (CNNMoney.com) -- As stocks put their worst year ever behind them, 2009 will be the start of a very slow and very painful recovery. Nowhere to go but up? This type of crap pisses me off, and it’s exactly why I’m writing my “cut the crap” article series. As far as I’m concerned CNN has no business even reporting on the business. This is the exact type of thing that confuses the public and herds them into thinking that markets only go up. We have an entire Baby Boom generation who has bought into this and their retirements are in the process of being destroyed. Those who do not exit here WILL NOT GET THE OPPORTUNITY AGAIN IN THEIR LIFETIMES TO RECOVER. If the Elliott Wave experts are right, and I think they are, and this is a grand supercycle correction, the market will be wiping the slate clean of this type of drivel soon. Remember, it was 1955 before market prices returned to the same level they were at in 1929, and this correction is likely on a higher level than that time frame. If you are a long term investor, missing market crashes is a MUST. And when it comes to real estate? NO WAY will prices return to previous bubble levels for YEARS. Just from a demographic perspective, the number of peak earners following the Boomer generation will be way reduced for quite some time, the next growth segment won’t be reaching their peak earnings years until the year 2022. If you are a baby boomer and have to wait until then for sustainable growth to resume, you have no chance of recovering losses greater than 50% in your lifetime. Real estate and stocks are NOT on sale YET. They will be, but not until the massive debts and derivatives are cleared. Not moved, cleared. Jan. 2 (Bloomberg) -- Billionaire Warren Buffett’s Berkshire Hathaway Inc. slumped 32 percent last year, the worst performance in more than three decades, as the U.S. recession forced down the value of the firm’s equity holdings and derivative bets. No where to hide is exactly correct in this situation. Buffett, who has slammed derivatives as being “weapons of mass destruction” placed large derivative bets that the market would not go down and stay down. He was wrong and will continue to be wrong because his adult lifespan was lived almost entirely during the greatest growth phase and credit bubble in the history of mankind. While he did see trouble brewing, he did not recognize the size, scope, and duration of the troubles. There are people who did, he was not one of them. …The stock plunge “doesn’t make any difference,” Buffett told Fox Business Network Nov. 21. I note that this timeframe will be NOTHING like those Buffet just mentioned. If you are age 50 or over and follow a “Buffett” buy and hold strategy, I’m going to flat out tell you that you will not recover before you retire, and if you then follow conventional financial advice and get very conservative as you age, you will likely never recover, certainly not to the levels that most financial planners who count on never ending 6 or 8 percent growth will have you believe. It’s not going to happen. Sorry, that’s just the reality and you can thank years of mismanagement on all levels for it. How could Buffett redeem himself in my eyes? He should be leading the call to reform entitlement programs; he should be leading the call for true financial transparency; he should be leading the charge to create a smaller military and government; he should be leading the call for all Americans to live within their means; he should be leading the call for real, not corporate sponsored, education about money; he should be leading the call for separation of corporation and state; and he should be leading the call to reform our current debt money system. Is that too much to ask? If he won’t stand up for what’s right, I will, somebody has to. Where are the other adults? Excellent recap of the year... Caution when uncovering the blanked out pictures, they are graphic. Predictions for 2009… Riders on the Storm! When pressure builds, nature transfers along the path of least resistance from high pressure to low. This is true with electricity, water, the air that creates the wind, and money. When there’s a storm brewing, you do not want to be the path of least resistance, that’s almost never a good thing! Trying to decide how to protect your assets in the storm that will be 2009? I would submit that if you do not have a clear understanding of the hurricane forces that underlie our economy, then you will continue to donate your wealth to the fiat currency gods, just as most people did in 2008! The securitization of debt process via derivatives created the largest credit bubble in the history of mankind – estimates are that on a per capita, dollar adjusted basis, that debt levels heading into this storm were 2.5 times a high as they were in the late 1920’s, just prior to the Great Depression. In our current monetary system, which is only 38 years old, credit money is created with the initiation of debt. When that “money” was loaned into existence, it literally was created from nothing – the ether. Now that the parabolic securitization of debt process is unwinding, those same false credit dollars are returning back to the ether from which they came. There is a powerful psychology that created people’s “buy in” to the bubble while it was being created, and there is a reverse psychology at work as the bubble unwinds. At each stage of the market decline, new bottom callers emerge which helps pull new money into the storm to be destroyed. The vast majority of people still do not see or understand this bubble, nor do they see how far it will unwind or how THEIR dollars will be drawn into the unwinding process. Thus, my first prediction is that 2009 will be the year of recognition. The fundamental psychology underlying ALL markets will shift from ignorance and hope to recognition that the problems run far deeper and far longer than most had previously believed. This recognition will discredit those who profess to have market and economic knowledge (these false “experts” permeate the financial industry and television), it will discredit the government agencies who manipulate and present false data, and it will remove the “hope” that a new administration has any chance of being more effective than the last at interrupting the unwinding process. Right now most people view the recent bubbles separately. They see a Japanese real estate bubble, a Japanese stock market bubble, a NASDAQ bubble, a housing bubble, a commercial real estate bubble, a derivatives/financial services bubble, an oil/commodities bubble, and now a bond market bubble. To most people these bubbles were inflated and the “money” moved from one to produce the next. That’s not what I see. I see one giant credit bubble that produced all those “sub-bubbles,” and at the root of the credit bubble is a monetary system that promotes never ending growth. Never ending growth is IMPOSSIBLE, thus the system is flawed (there’s a lot to this, my “cut the crap” articles are progressing through it). All this debt accelerated future earnings and it shifted forward in time the earnings of the Baby Boom generation. Now that the Boomers are progressing to the back side of their peak earnings curve (peak earnings occur at the statistical aggregate age 48.5), our population is faced with overall reduced earnings to service now skyrocketing debts. Earnings are the underlying support to stock prices. Earnings are still way overestimated for 2009, just as they were way overestimated for 2008. Soon we will begin to get earnings for the 4th quarter and those earnings will be overall less than estimated. That process will repeat over and over until stock prices go down enough to produce a MONTHLY close beneath the 2002 lows. We’ve already had the S&P produce a daily close beneath those lows – Half Way to Zero, but since we rallied back above and the DOW never did the same, many people falsely believe that we are building THE bottom. Nope, not THE bottom, just A bottom along the way. The move from October 2007, to November 2008 was likely wave ‘A’ of a Grand Supercycle A-B-C correction. Once that monthly close beneath the ’02 lows occurs, all market technicians will be hit between the eyes with the indisputable fact that this correction is on a higher corrective level than the 2000 – 2003 timeframe, or even that of the Great Depression. Those who study Elliott Wave already know that the earlier penetration has signaled this. As more and more technicians understand the technical ramifications, the recognition will spread that THE bottom will not occur in the year 2009, just as it did not occur in the year 2008. Over the past year, a very few TRUE experts have foreseen what has happened and have gotten it mostly right. IT IS CRITICAL THAT YOU KNOW WHO THE TRUE EXPERTS ARE, and that you heed their advice and not the advice of those who are trying to sell you something (most everyone in the financial industry, those on television, and those in the government). Take the wrong advice in 2009, and your wealth will be DESTROYED – you will simply donate your share of fiat money back to the ether from which it came. I’m really going to praise Karl Denninger here, because he has had the BALLS to say what is happening and to put his predictions in print. His newest set of predictions are now available and can be found here: Karl Denninger - MUST READ PREDICTIONS. I follow a lot of people in the financial industry and NONE have been as specifically accurate as Karl. Thus, I will not even attempt to outdo his predictions for 2009, I will simply state again that if you choose to ignore his track record and advice then you will simply donate your fiat dollars away. Please do a realistic self-assessment! Did your understanding and predictions for ’08 beat his? • The long term logarithmic uptrend lines will likely provide support in 2009, they are currently about the S&P 540ish area and at DOW 4,000ish area. Those are my target lows for ’09. Those lows may be broken in ’09, but if historic time lines hold, they will not be broken until 2010. I am going to largely exit the market entirely once S&P 600 is touched, and I will probably not do anything further with my money and the markets from that point on until I receive new long term buy signals. Why? Because gains from shorting the market will be difficult or impossible after that point, and going long any bounce in a severe bear market is just gambling unless you are playing for the short term bounce, and then you had better be doing good technical work. Another reason I will not try to play THE bottom is that I believe this to be a Grand Supercycle correction with game changing consequences which will play out well beyond 2010. Thus, “buy and hold” will not be a successful strategy for quite some time. • At least one major homebuilder will file for bankruptcy in 2009 (admittedly I thought this would happen in 2008 – mid-tier companies did, but the largest ones did not). Residential real estate will not find a bottom, and Commercial Real Estate will deteriorate rapidly, descending on the same line as residential, but lagging by 18 months. • The Federal Government will step in to bail out State governments who in turn will be forced to bail out local governments – or the Federal Government will just directly step in to bail them all out. State and local governments do not have bad derivative debt instruments like the banks to offer in loan program exchanges, thus the money will be added on to our national debt. Many government retirement plans do contain contaminated derivative debt and there is major trouble brewing there too. • The pain with financial institutions is not over and we will see more failures in the future. The truth is that all the major players are bankrupt if they are forced to mark their losses. Many believe that we have escaped the wrath of derivatives unwinding. That’s not true, we have only managed to hide the situation for now. The AIG bailout was all about hiding the consequences of derivatives, but at some point enough institutions will fail and the numbers will be so large that the government simply cannot bail them out. That may happen in ’09, but it will happen by then end of 2010. • Our current account deficit will increase by at least $1 trillion in 2009, but the true GAAP deficit will run in the multi-trillions. • Entitlement spending will not be curtailed and the math will continue to get worse. • Military spending will be sacrificed to some degree under Obama’s leadership. But, the military industrial complex will find a way to shuffle budget money away from “the military budget.” Base closures will become another topic for the Obama administration and states will have less power to stop them because of their own fiscal problems. • Obama will be “tested” and will have to respond to some geopolitical “crisis” within 2009 to prove that he is man enough to use our military, and he will. This, of course, will be orchestrated by the people who profit from such activity, as it always has been and will be. • I would not be surprised by an attempt on Obama’s life in 2009. Any “free thinking” by Obama, that goes against the interests of the central banks, will make this much more likely. This is very low probability, however, as he has surrounded himself with the same old central banker cast (he would not have been elected otherwise). • The relationship and balance between a healthy economy, a healthy national defense, and FREEDOM/SECURITY will become a topic of debate. You will begin to see this topic discussed more widely and Obama will pick up on it. Study the thinking of Thomas Jefferson for inspiration. • Infrastructure and alternative energy will be given much money & lip service as part of a “Great New Deal II.” These efforts will be a much better use of money than propping up the financials, BUT they will ultimately fail to turn this crisis by themselves. The math doesn’t work, and spending more money in infrastructure will not change that monetary math equation, it will only make it worse. All money spent will have to be borrowed into existence or it will be outright printed. Both cause the math to work against the people. Also, we cannot afford to maintain the infrastructure we currently have, adding new infrastructure adds to those costs and will shift the number of people who derive their income from the government up, not down which is the direction of a true and sustainable recovery. • By the end of the year most people will be referring to this crisis as GDII, but the government will most likely NOT acknowledge such until 2010. • Airline order cancellations will increase despite low oil prices. • Technology and small caps will under perform during declines and over perform during rebounds – underperforming overall. • All other reads by Denninger, including those of currencies, bonds, and commodities will prove to be correct or close to correct. While my outlook is still pessimistic, my overall viewpoint is optimistic in that this storm is a cleansing process. While America and her economy are great, they are certainly not perfect. Change will be painful, but in the long run I hope that it will be the impetus to push our economy and country to the next level up the evolutionary ladder. 2008, The Year in Review - Happy New Year! Come on, you have to smile, that's good stuff there! For the day, the DOW finished up 109 points, the S&P finished up 1.4% (after reaching 910 for the day’s high), the NDX closed the day up .9%, and the RUT led again, gaining 3.4%. I note that the indices fell back finally right at the close and that the futures only 15 minutes after the close are already off by more than the entire gain of the day, the DOW futures are down 120 points from the close already, and the /ES has already fallen to the 890 area. My rough calculations for the YEAR/(from last year’s PEAK) are as follows respectively: The DOW finished down 34% (38.2%), the S&P finished down 39% (42.7%), the NDX finished down 42.2% (45.9%), and the RUT lost 35% (41.7%). Remember, those figures are AFTER bouncing considerably off the November bottoms. Also remember that the average investor’s performance was worse than those numbers. Here’s a good one… for the year, of the 500 companies in the S&P 500, there were only 22 advancers and 478 decliners (and that’s with substitution bias higher and a year end rally). I note that end of day transactions pushed today’s volume above yesterday’s, thus creating a higher close on higher volume. The indices have been relentlessly higher for most of the day with the short term oscillators remaining in deep overbought territory. The S&P has managed to get to the 905 area and may be preparing a late day assault on the 912 level. If it does without pulling back prior to the close, those oscillators will remain very overbought over the holiday tomorrow. 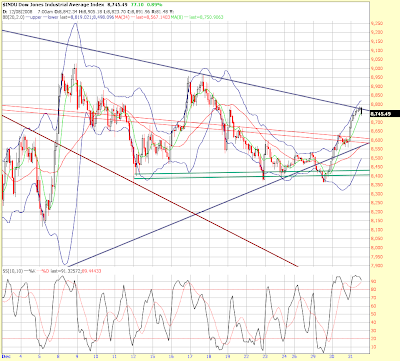 Gold is threatening to break out higher, but has yet to do so. 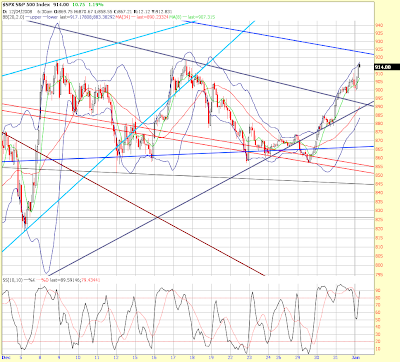 Geopolitical news could be the catalyst for it to do so over the weekend. I don’t like the risk/reward on that play here, but others might. The bond market is finally reacting with the long bond futures breaking under support, and TLT (20 year) has finally poked its nose under support as well, as you can see on the 3 month chart below. You can also see how today’s action has rolled the stochastic out of overbought. I’m going to leave you with a one month DOW daily chart. Note the low volume, the fresh new buy signal on the daily stochastic (all the indices have this), and the fact that the upper Bollinger is now moving up to create room for rising prices. The RUT (small caps) has been leading the advance and is very near to running into its upper Bollinger already. It’s also bullish that the indices were able to advance further above their respective 50 day moving averages, but we’re already running into that strong resistance area of 920ish on the S&P. I have to run to pick up my children at the airport and so any end of day report will be later than usual today, and I may not put one out unless there are large changes from this position. I’ll be making more posts over the holiday, so check back when you can. Well, we took a run at the 900 area on the S&P, but the short term stochastic is deeply overbought. 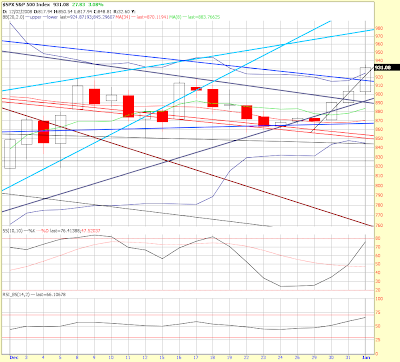 Here’s a 20 minute chart of the DOW, you can see that a sell signal is about to be triggered on the stochastic. You can also see that we’re coming to the apex of the purple lined triangle soon and that we just made a nice little 3 wave move into and are now coming back down. I’m thinking we’ll get just enough of a pullback to bring the oscillators down and then we can resume rally mode if we’re going to. You can see that if the pullback here makes it to the 8,600 area of the chart, it might present a decent long entry point if you don’t mind riding out the games that you know have yet to be played in the 920 area. Also keep in mind that the markets are closed tomorrow for New Year’s Day. California sits on the verge of bankruptcy, now their Comptroller warns that instead of tax refund payments, Californians may instead receive I.O.U.’s! The end of Ponzi finance is truly near if he actually implements such an idea. If you expect you'll be getting a refund from California when you file your 2008 state income tax return, be prepared: you may instead receive a "registered warrant." Translation: an IOU. California is rapidly running out of money. Blame it on the state budget deficit that continues to bleed billions of dollars from California's reserves. Facing inadequate credit to make up the difference, California's Controller John Chiang warns that by the end of February, the nation's most populous state may not be able to pay some of its debts, and instead be reduced to issuing those creditors IOUs. "My office has projected that, in approximately 60 days, there will be insufficient cash available to meet all expenditures reflected in the 2008-09 Budget Act," stated a Tuesday letter from Controller Chiang to the directors of all state agencies. "To ensure that the State can meet its obligations to schools, debt service, and others entitled to payment under the State Constitution, federal law, or court order. California may begin, as early as February 1, 2009, issuing registered warrants...commonly referred to as IOUs...to individuals and entities in lieu of regular payments." California has not resorted to IOUs since the 1992 budget crisis when Pete Wilson was governor. Back then, some 100,000 state employees got IOUs instead of paychecks for two months until the state approved a budget. The 1992 crisis came during summer, well past the tax season, but at least 12,000 tax refunds were also issued as IOUs, according to a contemporaneous report in the Los Angeles Times. State workers filed a lawsuit, arguing the IOUs violated the federal Fair Labor Standards Act. They were awarded damages. In this current cash crisis, The Controller's office expects that hourly state employees would continue to receive paychecks. But IOUs could be issued to elected state officials, including legislators and judges, and their appointed staff, some 1700 in all, "as well as tax refunds owed to individuals and businesses," according to Chaing aide Hallye Jordan. The Controller himself remains in a Texas hospital where he was taken after falling ill during a visit with family. Chiang has remained in communication with his staff by phone, Jordan told NBC Los Angeles Tuesday evening. The Controller's office will not take the emergency steps outlined in the letter to state agencies, Jordan said, if California can resolve its budget crisis in the next few weeks. But no new budget package has been proposed since the one presented by Democratic lawmakers was rejected by Governor Arnold Schwarzenegger as inadequate. "We've made very little progress the past couple of weeks," said Aaron McClear, an aide to Gov. Schwarzenegger, while the Governor was away from the capital on a holiday vacation. Even without a deficit resolution, issuing IOUs is not the only option for tax refunds. The state could simply delay payment. Under the law, it has until May 30, Jordan said. In 1992, banks honored the state's IOUs, cashing them on demand, and then receiving an additional 5% from the state when it made good on the obligations. In effect, the IOUs served the state as unsecured bridge loans from banks. But this time around, with credit tight and banks still feeling the impact of the fall meltdown in the financial services industry, it is not yet clear how banks will respond. "Nobody's making any decision whether 'Bank X' will take the IOUs as money or not," said Brian Tobin, a Culver City based tax preparer. At the request of NBC Los Angeles, Tobin reviewed a copy of Chiang's letter. Tobin noted that in past years, California's Franchise Tax Board has processed electronic refunds in as short a period as a week. This raises the possibility that taxpayers with simple returns who file as soon as possible after New Year's may be able to receive refunds before the proposed February start date for issuing IOUs. Those who could be most affected are taxpayers who routinely plan for large refunds as a means of saving for anticipated expenses, such as property taxes which are also due in April. But with notice coming at year's end, there is not time for those taxpayers to adjust their withholding or take other steps to try to capture their return in advance from the state's coffers. "They've got their money taken out of your paycheck. That's it," Tobin said. One final irony, Tobin sees: electronic deposit refunds are inexpensive to do. Instead sending out IOUs is a more costly procedure for a state looking to save money. Now, if you think that is bad, wait until you get a load of how some of the local municipalities inside of California are Ponzi financing their debts. Here’s a story in today’s LA Times Business Section: Creative borrowing catches up with California cities. Financing schemes that sidestepped voter approval have put local governments deeper in hock. Oxnard was in a bind, facing a $150-million bill to fix cracking and crumbling streets and no way to pay for the work without cutting other services. The city had tried, and failed, to get voters to approve a bond measure for street repair. And it had borrowed money against almost all of its public property, including a soccer stadium, three fire stations and its library -- even the Police Department's evidence-storage building. With virtually nothing left to hock, the city came up with an ingenious way to take on more debt: It borrowed against future revenue by "selling" its streets to a city-controlled financing authority. "We had way too much construction work to do and way too little money," said Ken Ortega, Oxnard's public works director. "We really pulled every creative financing string we could to come up with the money." Desperate for cash in a sputtering economy, local governments throughout California are digging themselves deeper into debt, and many are doing so through exotic financing schemes designed to sidestep the need for voter approval. California cities, counties and other agencies borrowed $54 billion last year, nearly twice as much as in 2000, and governments are straining under the load. Statewide, 24 cities and public agencies missed scheduled debt payments this year or were forced to tap reserves or credit lines to stay current, records show. That's up from nine in 2006, according to the bond industry's self-regulatory agency. The city of Vallejo, burdened with huge debt obligations, in May became the largest city in California history to file for bankruptcy protection. Chula Vista, Orange County and Palmdale are among the other cities and counties staring at red ink. Much of this borrowing binge was made possible by complex financial schemes such as the one Oxnard used. These nontraditional debt vehicles cost more over the long run because they are considered riskier than general-obligation bonds, which governments stand fully behind. Investors therefore demand higher interest rates. "There are many cities and counties engaging in complex financial deals that they don't really understand," said Michael Greenberger, former head of the trading division of the Commodity Futures Trading Commission. "And now it's starting to catch up with them." What a mess! I wouldn’t want to be living in California right now, I wouldn’t want to be buying municipal bonds, and frankly, I think this is just the tip of the iceberg. Wait until people fully realize how much debt there is throughout all levels of government. It’s overwhelming, there’s been no adult supervision for more than a decade – probably more like 3 decades. This is an excellent and interesting article that I have posted in its entirety. You can find the original here: Phantom Bonds, it is dated 11/26/08. This way of doing “business” is making a mockery of our entire financial system, which is clearly Ponzi in its entirety. What’s happening now in the bond market is going to eventually end in much pain and suffering, it’s only a matter of when. I believe it will begin on some triggering event, most likely related to foreign capital flows. The “credit crisis” is largely a Wall Street disaster of its own making. From the sale of stocks and bonds that are never delivered, to the purchase of default insurance worth more than the buyer’s assets, we no longer have investment strategies, but rather investment schemes. As long as everyone was making money, no one complained. But like any Ponzi Scheme, eventually the pyramid begins to collapse. For the last couple of months trillions of dollars worth of US Treasury bonds have been sold but undelivered. Trades that go unsettled have become an event so common that the industry has an acronym for it: FTD, or fail to deliver. What’s the result? For the federal government, it’s an unnecessarily high rate of interest to finance the national debt. For states, it’s a massive loss of potential tax revenue. And for the bond buyers, brokerage houses, and banks, it’s yet another crash-and-burn to come. First, a primer: The Federal Government issues as many bonds as Congress authorizes (the total value is an amount that basically covers the national debt). Many are purchased by brokers and investors, who then re-sell them in “secondary” trades. The way the system is supposed to work is that the broker takes your bond order today and tomorrow takes the cash from your account and ‘delivers’ the bonds to you. The bonds remain in your broker’s name (or the name of a central depository, if he uses one). If there is interest, the Treasury pays the interest to your broker and he credits your account for the amount. What is happening today that strays from this model? Because the financial regulators do not require that the actual bonds be delivered to the buyer, your broker credits you with an electronic IOU for them, and, eventually, with the interest payments as well. But the so-called “bonds” that you receive as an electronic IOU, called an “entitlement”, are phantoms: there aren’t any bonds delivered by your broker to you, or by the government to your broker, or by anyone. The significant result of the IOU system is that brokers are able to sell many more bonds than the Congress has authorized. The transactions are called ‘settlement failures’ or ‘failed to deliver’ events, since the broker reported bond purchases beyond what the sellers delivered. Since all of this happens after the US Treasury originally issues the bonds, the broker’s bookkeeping is separate from US Treasury records. That means there is no limit on the number of IOUs the broker can hand out...and there are usually more IOUs in circulation than there are bonds. The ramifications are far reaching for the national budget. Wall Street, by selling bonds that it cannot deliver to the buyer — in selling more bonds than the government has issued — has been allowed to artificially inflate supply, thereby forcing bond prices down. These undelivered Treasuries represent unfulfilled demand by investors willing to lend money to the US government. That money — the payment for the bonds — has been intercepted by the selling broker-dealers. The subsequently artificially low bond prices are forcing the US government to pay a higher rate of interest than it should in order to finance the national debt. 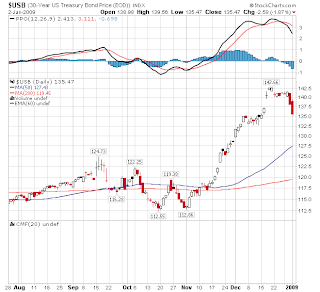 The market for US Treasury bonds has been in serious disarray since the days immediately following September 11, 2001. Despite reports, reviews, examinations, committee meetings, speeches, and advisory groups formed by the US Treasury, the Federal Reserve, and broker-dealer associations, massive failures to deliver recur and persist. Somehow, government, regulators and industry specialists alike believe that it’s OK to sell more bonds than the government has issued. It shouldn’t take a PhD-trained economist to tell you that prices are set where supply equals demand. If a dealer can sell an infinite supply of bonds (or stocks or anything else for that matter), then the price is, technically-speaking, baloney. And the resulting field of play cannot be called a “market”. If regulators and the central clearing corporation would only enforce delivery of Treasury bonds for trade settlement — payment — at something approaching the promised, stated, contracted and agreed upon T+1 (one day after the trade), there would be an immediate surge in the price of US Treasury securities. As the prices of bonds rise, the yield falls. This falling yield then translates into a lower interest rate that the US government has to pay in order to borrow the money it needs to fund the budget deficit and to refinance the existing national debt. This week’s drop in the yield on US Treasuries was accompanied by a spike in bond prices. The data won’t be released until next week, but you can expect to see that a precipitous drop in fails-to-deliver occurred at the same time. Don’t get your hopes up, though. One look at the chart above will tell you that the good news won’t last until real changes are made to the system. As a bonus insult to government, consider the $270 million in lost tax revenues to the states. This is because investors (unknowingly) report the phony interest payments made to them by their brokers as tax exempt; interest earned on US Treasury bonds is not taxed by the states. For the bond buyer, the situation poses other problems and risks. As an ordinary investor, you’re not notified that the bonds were not delivered to you or to your broker. Of course, your broker knows, but doesn’t share the information with you because he or she plans to make good on the trade only at some point in the future when you order the bond to be sold. The electronic IOU you received can only be redeemed at your brokerage house, and no one knows what will happen if it goes under, although I suspect we’ll find out in the coming quarters as more financial institutions get into deeper trouble. You’re probably not aware that, in order to cash in that IOU when you’re ready to sell, you depend not on the full faith and credit of the US government, but on your broker being in business next month (or next year) to make good on the trade. In other words, you’re taking Lehman Brothers risk, and receiving only US Government risk-free rates of return on your investment. Your broker, meanwhile, enjoys the advantages of commission charges for the trade, maybe an account maintenance fee and – more importantly – they use your money for other purposes. Wall Street is not sharing any of this extra investment income with you. In my analysis of Trade Settlement Failures in US Bond Markets, I calculate this “loss of use of funds” to investors at $7 billion per year, conservatively. Now for the really bad news. The tolerance for unsettled trades and complete disregard for the effect of supply on setting true-market prices is also responsible for the "sub-prime crisis," which everyone seems to agree on as the root of the current global financial turmoil. You see, there are more credit default swaps — CDS — traded on mortgage bonds than there are mortgage bonds outstanding. A CDS is like insurance. The buyer of a mortgage bond pays a premium, and if the mortgage defaults then the CDS seller makes them whole. CDS are sold in multiples of the underlying assets. A conservative estimate is that $9 worth of CDS “insurance” has been sold for every $1 in mortgage bond. Therefore, someone stands to gain $9 if the homeowner defaults, but only $1 if they pay. The economic incentives favor foreclosure, not mortgage work-outs or Main Street bailouts. 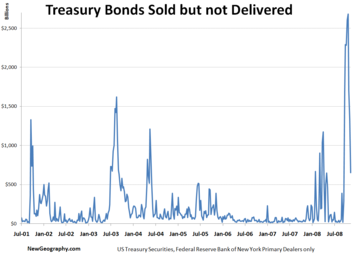 In the same process that is multiplying Treasury bonds, sellers are permitted to “deliver” CDS that were not created to correspond with actual mortgages; call them “phantom CDS”. According to October 31, 2008 data on CDS registered in the Depository Trust & Clearing Corporation’s (DTCC) Trade Information Warehouse, about $7 billion more CDS insurance was bought on Countrywide Home Loans than Countrywide sold in mortgage bonds. That provides a terrific incentive to foreclose on mortgages. Countrywide is the game’s major player: The gross CDS contracts on Countrywide of $84.6 billion are equivalent to 82% of the $103.3 billion CDS sold on all mortgage-backed securities (including commercial mortgages) and 90% of the total $94.4 billion CDS registered at DTCC sold on residential mortgage-backed securities. General Electric Capital Corporation is the fifth largest single name entity with more CDS bought on it than it what it has sold; someone is in a position to benefit by $12 billion more from consumer default than from helping consumers to pay off their debt. Only Italy, Spain, Brazil and Deutsche Bank have more phantom CDS than GECC, according to the DTCC’s data. The US auto manufacturers also have net phantom CDS in circulation: $11 billion for Ford, $4 billion for General Motors, and $3.3 billion for DaimlerChrysler (plus an additional $3.5 billion at the parent Daimler). Of course, these numbers change from week to week and only represent CDS voluntarily registered with the DTCC, so the real numbers could be much greater. Who stands to gain? There is no transparency for CDS trades, which means that we don’t know who these buyers are. But in order to get paid on these CDS, the buyer must be a DTCC Participant… and that brings us to Citigroup, Goldman Sachs, JP Morgan and Morgan Stanley – all Participants at DTCC and instrumental in designing and developing CDS trading around the world. By the way, these firms are also in the group that reports FTDs in US Treasuries; the top four firms represent more than 50% of all trades. You can do the math from there. The US government and regulators are in the best position to end these fiascos, turn us away from casino capitalism, and return our financial industry back into a market. It won’t require any new rules, laws or regulations to fix the situation. If someone takes your money and doesn’t give you what you bought, that’s just plain stealin’, and we already have laws against that. 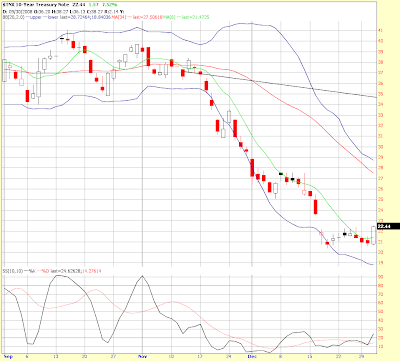 Today the VIX is down another 4%, and has broken down out of its latest consolidation range. This is further confirmation of a bullish trend in stocks for now. The VIX is a derivative that measures certain option buying activities (a good site to learn more about the VIX is: VIX and More, start by looking at their top 10 articles of the year post). It measures “volatility” and is indirectly a measurement of fear (the VIX is only 1 volatility measurement, there are many such as the VXO, VXN. Plus, there are many other fear gauges as well). I use the VIX/VXO as one gauge to help me decide where the market is psychologically. There are three components which must be considered in any market; fundamentals, technicals, and psychological. Since the VIX is a derivative (it indirectly measures an underlying), some believe that technical analysis (TA) on the VIX is utter nonsense. I say they are mistaken big time. I’ve used TA on the VIX for years and have seen it work consistently. But yes, you do have to keep how it works in mind and give it a little more leeway than you would TA on a direct asset. Let’s start with a 20 day, 20 minute chart. Note that today’s action just broke down out of a sideways consolidation channel. Also note that the stochastic is oversold in the short run, but if you look back a few days you can see that it can stay in oversold for quite some time. 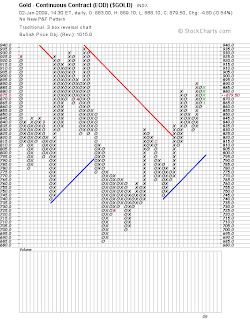 That 20 target comes from this computer generated Point & Figure chart (courtesy of stockcharts.com). 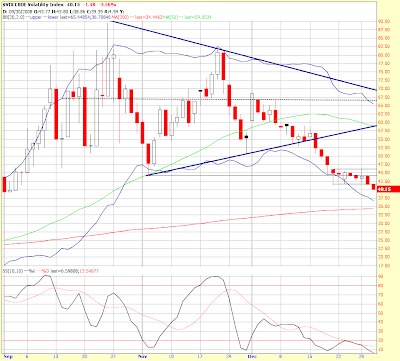 In order for us to reach that target, the VIX will first have to break pretty strong support in the mid 30’s. Now let’s look at a 60 day, 60 minute chart and apply a little basic Elliott Wave analysis. From the peak at 90, you see a precipitous 50% decline all the way to 45 that I am labeling as wave 1 down. 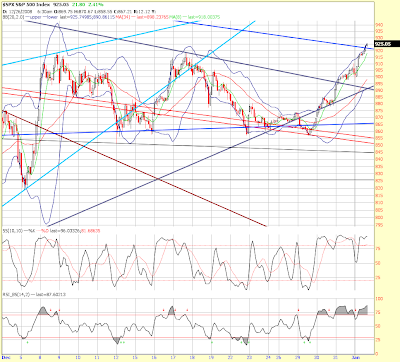 Next is a very large retrace back up to more than 80. Deep retraces are a hallmark of wave 2’s, and that’s how I have labeled that move. Next you can see a decline to my smaller red number 1, and if you count the movement inside of that move, you will find 5 smaller waves. Then a nearly perfect 50% Fibonacci retrace to the red #2, followed by a wave 3 movement down, which again contains a very clean 5 wave pattern inside that. From that red #3, we moved sideways over the past few days which is typical of a wave 4 movement and it now looks as if wave 5 down is underway. When wave 5 down finishes, that will finish the larger wave 3 down, and I’ll bet it ends in the mid 30’s. If this is a 5 wave movement, I would then expect sideways consolidation in the mid 30’s to produce a larger wave 4, which would be followed by a 5th wave to the eventual low. It’s also possible that this is not a 5 wave move and is only a 3 wave A-B-C… don’t know. What does this analysis tell us? That it would appear lower volatility is going to be with us for a while and that portends interim higher prices for equities. That is consistent with Elliott Wave work in the equity indices which place us in the larger wave ‘B’ up/sideways which should be followed by the very destructive wave ‘C’ down to the eventual bear market lows. This also coincides with Martin Armstrong’s work in waves which calls for a rally through about March of 2009. I’m not certain of that timing, I’ll be looking for other technical indicators to decide when wave ‘B’ is ending. Remember that if you are using options, the volatility is a large component of the intrinsic value (IV) of options. As the VIX falls the intrinsic value of all options will decline, the further out-of-the-money (otm), the larger the decline. The reason for this is simple; low volatility means that the odds of reaching targets far away go down. In a high volatility environment one expects the likelihood of reaching far away targets to be higher, thus the sellers of options want more money from the buyers as their risk is greater. That means that as the VIX moves down, the price of otm PUTS will drop dramatically, while the price of way otm CALLS will not gain in value as quickly as you might expect when the market goes up. Thus, if you are playing long with options here, my advice is to buy in-the-money calls or use another vehicle entirely like the 2x or 3x ETFs (caution: I do not consider the leveraged ETFs to be “buy & hold” instruments for any significant length of time – they are good for short term trades only). Hope this analysis is helpful, comments are always welcome. Breaking News - Yet Another Bailout Request!